Fiona Bruce and the Antiques Roadshow team head to Burton Constable Hall near Hull. Objects brought in by visitors include a ship's anchor found in a garden pond. Browse content similar to Burton Constable 1. Check below for episodes and series from the same categories and more! to Burton Constable Hall in the East Riding of Yorkshire. and flamboyance seems to have been written into their DNA. as a Roman orator and statesman. of culture and literature, Rousseau. the whole suite of furniture. but William took it to the next level. for the 18th century is astonishing. It's like a chamber of horrors in here. desiccated leg of an elk. This is a mammoth tooth. My favourite - a bezoar. Between you and me, that's a hairball from a cow! William Constable is a man we'd like to see at today's roadshow. from the East Riding of Yorkshire and beyond. wonderful, Edwardian vis-a-vis tin plate car? on the road, a full-size one, and saying, "Dad, buy me one!" -And at Christmas time, hopefully this would have arrived. So, 1903... Has it been in the family forever? I don't know any more than that. My father used it as a child. Beyond that, I can't really give you any more of an answer. And so maybe your father was born in the 1920s? -So he probably inherited it from his father. -And when was he born? -In 1892, something like that. So he'd have been a ten or 11-year-old? it's a steam car that actually worked from steam, not clockwork. and that would have actually powered the rear wheels. it's in its truly original paintwork. and you can see it from all sides. On the back is the maker's mark and it's got upholstered seats. so exactly like the full-sized car, wouldn't have gone very fast. But can you imagine seeing that out on the road as a full-size one? -One you can still see on the Brighton run. so it was a special treat, obviously, for your grandfather. It would have been several pounds, which is hundreds of pounds today. -On the downside, the tyres are deflated. -It's missing some of the stanchions around the back there. It's been in the family since 1903. What's going to happen to it after you've finished with it? Well, obviously, I've got two sons and a daughter. -Any of them here today? -My daughter's with us today, yeah. -Do you like the toy? OK. Well, maybe you'll like it a bit more when you know about the value! -but it's what every collector wants to find. -but you can't have everything in life. At auction, I would suggest a figure of between £8,000-12,000. Now do you like it better? So, I think where we know where it's going to go in the future. -Lovely, thank you ever so much, thank you. You've brought me this lovely little box. if you would, how come it came into your possession? my grandparents', and it was given to them at their wedding in 1912. Oh, OK. And your grandfather used it to keep stamps in, is that right? used for anything else before that is. Snuff, yeah, I suppose that was very popular back then, wasn't it? -It's actually a bit older than your grandparents' wedding. Yeah, it dates to 1839. ..inside, there's a little lid within the lid that's pierced. -where your grandfather kept his stamps. It isn't a stamp box. -It's not a snuff box either. where the stamps are now would have been a sponge drenched in scent. -to protect yourself from the vile smells. Vinaigrettes are a big collectors' area. they like them big and grand and gilded and what have you. which are the real prizes, cos they're terribly rare. Now this one... Actually, oddly enough, it is by a good maker. who's probably the best box maker of his generation. which is what all the vinaigrette collectors want. but it's a very, very nice vinaigrette. It's in remarkably good condition. and hasn't really been got out since then. cos there's hardly any wear on the top. -I've always kept it in the dark. Best place to keep it, really! OK. That's obviously done it some good. for keeping silver in good condition! but it helps being Nathaniel Mills and it helps being a castle top. it's going to cost you somewhere in the region of £1,200-1,400. -you would have had to be very wealthy. -Why do you have them? -I just absolutely have a passion for them. pram, and it started from there at the age of eight or nine. I just absolutely adore them. And how many have you got? I've got 95 at the minute. Where do you keep your prams? but they do come out and they do go to local events in the area. And how long has it taken you to collect 95 prams? -So you've got 95 prams in the last six years? -So where do you find them? looked after and cared for and taken to local shows. And how much do you tend to pay? The most I've ever paid is for this one here, and that was 500. This is a particularly fine example. which people often talk about for two babies. it's nice and narrow, so it could go down alleyways. you can take the hood and bring it the other way. -This is a rare pram, which I'm sure you know. Thank you. I do, yeah, thank you. It originally came from a London department store. -in a very top department store. -This was not a simple thing. That's why they're so beautifully decorated. -that was to be pulled by a goat or a small pony. -..for the wealthy households of the day. I could easily see it at £700-800. you've invested quite a bit of money. I have, yes, it soon adds up. it was being done long, long before that company ever existed. when it's fully set up. Could you help us, please? So, what's your story about this table? all of my lifetime, so it has some age. the original piece of flat pack furniture. The only place I have seen anything like was at Cotehele House. -came from a Spanish galleon. -It wasn't as fancy as that. the days before dining tables were invented. So what date are you thinking of? I've always argued it was 17th-century. -I'll make that commitment, yeah! I think we can agree that it's not English. It is a continental piece and it's made of oak. If it was Spanish, I would expect to see some metal down there. to me, it says it's Dutch. It is controversial, but that's my opinion. which I've seen and handled over the years. So, yes, I like the idea. It's a metamorphic piece of furniture. It's to be closed down, then set up. Did you notice the hinges underneath? -These lovely hinges, what we call butterfly-shaped hinges. Nice little feature to see. The date of it, I'd say late 17th, early 18th-century. So, it's a transportable dining table. -It's a nice piece of furniture. -People look at... brown furniture and say, "It's not fashionable." it works in an antique household. It doesn't argue with anything. And, to me, this ticks the boxes. I would put a value on this around £2,000. -Does that make you smile? It's bound to make you smile, isn't it? "How much is the table worth? £10?" and, indeed, you have every reason to blow yours. -Well, I represent the Kirkbymoorside Town Brass Band. that we're very proud of. Yeah, and the rather clumsily named ophicleide. -Yeah, and what an extraordinary thing. "Hey, up, you've got a ship's foghorn!" -I mean, it's enormous, isn't it? but it's sculptural quality is quite magnificent. Why does this belong to you? whose ancestors played in the band back in the 19th century. because the joiner in question was Jane's father. played in the band in the 1850s. We think so. We're not entirely sure of that. as in that old photograph. which was, as its name suggests, a great, sort of, coily thing. -or perhaps even the tuba. It's sort of in between the euphonium and the tuba. -OK. Can you play this for us? but I'll give it a go! -We have got a tonal home open, haven't we, with no key? -That's about as much as I can do with it, I'm afraid! but you want to know, presumably, what it's worth. but you tell us differently, that'd be great, yes! -but, you know, they're quite rare. with the provenance, a price of around £1,200. That is a surprise - I thought it would be worth scrap value! Does anybody want some tea? but, of course, what we're looking at is, in a way, rather more exotic. I mean, I can see here portraits of two Maori chiefs. -Who are they? Why have you got them? Well, my father went out to New Zealand in about 1924. For the first time. He went out twice altogether. And the last time, he came back in '31. hung up at home when I was a kid. Absolutely terrified us, my sister and myself! they've been on top of a wardrobe at home. So, they've never had... They've been popular, let us say. -So, what was your father? to do sort of civil engineering-type works in New Zealand and Australia. are hand-painted portraits of Maori chiefs. We assume them to be actual people. there was an increasing awareness of what Maori culture represented. almost kept at a distance. "Actually, there's an interesting history there." and, therefore, Maori culture was very much on the up. Don't take this wrong, but these are, frankly, tourist pieces. "that essentially were New Zealand?" to most of us, but these do highlight certain aspects. The body decoration - the tattooing, and so on - is very, very important. It is tribal marking that identifies where they're from. And, there is a cloak made of bird feathers. Again, absolutely classic Pacific, South Pacific and Maori culture. throws an insight into what the Maoris looked like. This again reflects that increasing interest in, who are these people? -We'll never know who the artist is. They're hand-painted on black velvet. It's actually art projecting a culture into a tourist market. "Frank, from Auckland friends, February 1931." So, do you think that's when he was actually leaving to come back? That was the last time, yeah, when he came home the last time. Yes. -but very much as a tourist piece. -A tourist piece. It looks it, yes. for an ever burgeoning tourist market. frankly, £100 for the lot. and you're here with your jewellery. How have you ended up bringing it to us? and we came across these. which dates from round about the late '20s, early '30s. as we're seeing here, and was used to imitate diamonds. lots of people wouldn't really notice. but really very pleasing to the eye as well, isn't it? which is also in the pendant drop down here. that we see around the mount, all set in yellow gold. The pendant, if we look at the back, we can turn that over. And, of course, there's a locket in there as well. depending on what the owner really wanted to do. Set in probably 18-carat gold. So, all in all, I really like both pieces of jewellery. And I'm just wondering what our surrounding audience are thinking. Who likes this one here? The marcasite one. OK? OK, yeah, yeah. Hmm. No. Hands up for this one over here. -You said you didn't prefer them. You liked both of them. -Oh, but they might eventually become yours. -Well, my sisters and I, yes. Well, we do have two very differing pieces of jewellery. we're looking at maybe £20-30 for the set. But it shows it's been worn. Jewellery's there to be worn. Wow! I...I just can't believe it. I thought it was costume jewellery. -you own the yacht that goes with it. No, I wish we did, yeah! So, um, how come you've got it? but it was kind of buried in the old pond that was there. We only saw the top half of it. it was quite a lot bigger than we thought. I mean, it's a strange thing to leave behind. I don't know how it would have ended up there. -We're not far from the sea. and later, so there would have been many of these around. Maybe this is a souvenir. Where does it live now? Still in our garden! It's like a feature now. they are all the same design. and it would have hit the seabed as you see it now. ..and it starts to grab the seabed. until you wanted to leave. And then you would have gone over the anchor. and you could pull it up on to the ship. -you wanted, to be drifting with a very expensive ship. -so, not a rare piece. -But a great garden ornament. as a decorative item, somewhere in the region of maybe £300-400. Great! That's quite a lot more than we expected, isn't it? Yeah! so, we've come in here, into the tea tent, to film it. I'd have been in seventh heaven. Is it something you've played with? we were allowed to play with these under supervision. so, yes, we did play with them, occasionally. Cos they were obviously from the late 1920s, early '30s. -And they're all different characters. -and put up a Photofit image of them. -But this is much more fun. When I was a kid, I loved faces and drawing. This would have been right up my street. "I'm not sure that you're right." And that was the dead chuffed one. ..which is the very angry visitor to the Antiques Roadshow. He thinks we've got the valuation wrong. But it's the sort of games you can play with these things. -..not knowing anything about it. in search of something weird and wonderful. ..and we have to guess what it's used for. by the East Riding's museum collections. but then with this dish on top. It's a curious thing, isn't it? combat problems and issues that they felt were important. So, what are those issues? Well, there are three I'm going to throw to you. whether it was bronchitis or whooping cough, or even asthma. To clear the chest. Are you listening, ladies and gentlemen? ..if only for help in trying to work it out! It is actually an insect repellent. What, in the late 1800s? and not disturb their calm peace on a Sunday afternoon. -Midgies and what have you? in the fact that, of course, smoking was, you know, a habit. -What, even before they'd started? "To avoid that embarrassing, smokeless scent." ..the aroma was already there in the room. Maybe you couldn't make that up! OK, let's have a hands up for that chesty cough! OK. That embarrassing smokeless odour. I wouldn't be surprised if it is that. You wouldn't be surprised if it is that? And then the insect repellent. Hang on. That's what they're going for, Will. I don't really associate it with women sitting outdoors. It doesn't really do it for me. I think it's the first one. It sounds more plausible. You think it's putting the tar in? -SCOUSE ACCENT: Where are you from with your accent? Yeah, I thought you might be! ..with the coal tar to cure a chesty complaint of some variety. That's what the going for, isn't it? Yeah. That's the one. You and I have done a few of these over the years, haven't we? -And you love it when I get it wrong! -And I've won every time, haven't I? -I bow gracefully to you. You got it! Yeah, that smokeless, embarrassing thing. It was a good line though! It was brilliant! Well, I think we've done rather well there. -Will, we caught you out. -Me and my new friend. -Do you know what is? but I don't know much about it from there. if you're practising, you do tend to push through your fellow troops. and they would train with these things. and they would practise bayonet fighting. I've had it, must be, what, 47 years now. I actually found it in the loft of my dad's house. I was only ten years old. We'd just moved in. He said, "Go up and have a look what's in the loft." So, he put me on the shoulders, up I went, and I found it. I found it behind the chimney in the loft when we'd moved in. And it's just been propping my garage door open ever since then. thing on there. But what does the X underneath mean, sir? You've got 1915 and the broad arrow stamp. Then the cross means it's released from service. as opposed to somebody nicking it. Goodness me. And it needs quite a bit of force to push it in as well. It's not going to be a lot of fun in your chest. the thing, the bayonet charge. It was...terrible tactics against modern weapons. but if something like this came up, I would think £200-300. -I've had such a long time, I'm not going to part with it. This is a very pretty, little oil sketch. It's so swiftly painted. Where did you get it? and it cost me 75p. All right. Do you know who it's by? It's by W Kay Blacklock. You can tell that, cos it's signed clearly, can't you? -Did you ever look him up or try to find out anything about him? So, I did wonder whether this might be Staithes. You know, there's a fishing village up in the north-east? -Yeah, I've heard of that. -Lots of artists went there. But it turns out it isn't Staithes. ..which is a sweet, little Cornish fishing village. Lots of artists went there. It wasn't quite a colony, but chuck a stick and you'd hit several. -It was absolutely seething with artists. -of light on the water. And the fisherfolk going about their daily business. No tourists in those days. We're talking about 1880, something like that. -A nice thing. And you paid, what, 75p? Hm. Well, I think it's worth £600-800 now. -I know. It's gorgeous. I love it. How long have you been picking it out? About six or seven years. and then got obsessed with it, basically. So, how many pieces have you got? Erm, about 100, I think. I've just gone a bit OTT with it. Are they all the marigold colour or have you...? so, it's mainly this, yep. So, you know what it is, its name, don't you? Carnival was actually a British invention in America. Just before the First World War. of the first Ford motor car. Against that, this was sold for cents. and it completely blew the market in Tiffany glass. This stuff was working-class glass. on the hoopla. So, how much are you paying for something like that? -And these, I bought separately, for £10-20. -you get two vases for the price of one. There's your standard vases, which is how you bought it. you know that it actually is one of two parts. which takes up less space, and it's adaptable. Yeah. -And these were just pounds, really. You know what it is? This is a taste issue. -Nobody likes it in the family, other than me! how any people actually want it? Well, why does stuff go down in value? You know why - cos nobody wants it any more. -Here's your son's present for 60 quid. I mean, I think you'd be lucky to get that for the entire table. but, clearly, it will live to fight another day. -Thanks for bringing it in. a genie's going to pop out and our wishes will come true! It's actually made by quite a famous designer. I don't know if you've heard the name before - Christopher Dresser. -The date is about 1880. -Round about £5, I would think. Well, I can tell you, you're comfortably into four figures. -..courtesy of these two ladies here. Would you like to take up the story? and met lots of people, of course, over the years. gave me some of her things. when he was 16 years old, in 1898. So, here we are. This is the picture. -that it came back to you. -Oh, that is so precious. because, of course, this was contemporaneous at the time. -..since that is your drawing. -Thank you very, very much. -It's our very great pleasure. This is accepted with love and gratitude. This is wonderful. This has come home today. costume jewellery I think I've seen for a very long time. -Erm, well, it's at least 50 years old. It belonged to my mother and her nans. and, in those days, everything was very glamorous. And so I guess she wore quite a bit of it. some of it will have been worn by the models, who used to model it. in, sort of, mid-20th-century costume jewellery design. I don't really know where to start, to be honest with you. This bracelet here, for example. for Cartier in Paris in the 1920s. it's set just the same as real Cartier jewellery would be set. At a glance, you wouldn't know that that wasn't the real thing. Probably late '40s, early 1950s. And this set, equally, is by Bucher. They must have been very stylish ladies. You wouldn't know it wasn't a real thing, would you? and they wouldn't have been cheap items when they were sold. -But it comes from an era when people were terribly glamorous. Exactly, it was a different age. for the Hollywood stars of the day. Beautiful. I love the bull's head there. This is very Art Deco in style. Obviously, in the 1970s, Art Deco styling was very popular. so, it looks Art Deco, but it's 1970s. This is an Italian designer, Coppola and Toppo. They were very well known for their beaded necklaces. Again, that's a fantastic set. You've got some other little pieces by them as well. because it matches my dress! These are both silver rings. This one is just silver and this one is silver and gold-plated. Again, at a glance, you wouldn't know they weren't the real thing. -So, have you considered values on them at all? No. I've no idea. Absolutely none. for good, designer costume jewellery. Particularly from, you know, the 1940s onwards. that I've seen this - just the bangle - for sale, for £1,000. you've got the matching earrings and the matching necklace. That's got to be, at auction, £800-1,200. you're probably looking at a minimum of maybe £5,000-8,000. I mean... It's really artificial, basically. but just using base metal rather than the real thing. And they would have been expensive when they were new as well. -flying off the shelves, is it? But I'm guessing this word here is why you brought it to me. -Are you a Tolkien fan? Yes, I've been a Tolkien fan for most of my life. but they're songs in Old English. Old English and I think some in Norse, maybe. -Tolkien's earliest appearances in print. -he was teaching at the University of Leeds. He was teaching at Leeds in the '20s. -This wasn't published till a decade later, and in London. ended up in London and gave these poems to his students to print. -It was a printing exercise. -So, as we can see, it's quite amateur, if we're honest. Where did this come from? Where did you get it? "I've got one of these." I knew of them and that they were rare. And they said, "It's £2,000." And so I talked to my wife, I thought, "That's a lot of money." And we thought, "Well, we've got the money,"
cos we'd been saving up for a new car - or a new second-hand car! And then we said, "Well, the bank will lend us money for a car." So we rang them back and said, "Yes, we'll buy it." what would that car be worth today? It wouldn't really be worth anything now. Absolutely nothing. So what's this worth? you may have a copy of The Lord Of The Rings. but they're relatively common in comparison to this. you'd want a copy of this. and you would look long and hard, I think. a very historic group of medals. and I want you to tell me all about this gentleman, Arthur Casement. Arthur Casement was my great-grandad. Lived in Hull all his life. He was a seaman. ..and a good job of it. And so, why has he got this medal, the Polar Medal? that went with Scott to the Antarctic. when he was frozen in. -That's the 1901 Scott expedition to Antarctica. and also we have a wonderful picture of Arthur on deck. It's a great visualisation of those men, who were very brave. -Now, we all know the story of Scott, don't we? expedition that wasn't the expedition in which Scott died. -But it was the precursor, the 1901 expedition to Antarctica. but he got locked in the ice for 26 months. in trying to release Scott from the ice. so then they had to send for help. than they do about Morning, in fact. -Maybe it's the name, I don't know. Now, he was obviously a really well regarded seaman. We have his discharge book here and there are various entries for it. which, obviously, is incontrovertible evidence. "shown himself to be a hard-working, zealous and very capable seaman." It's a great reference, isn't it? him as well. That medal is an Edward VII medal? And it's with his First World War service medals as well. -Now, the Polar Medal itself is actually a bronze medal. It was also issued in silver. The office has got the silver medals. about 200 have been issued throughout its history. Now, that's not many medals. in rescuing Scott and helping to rescue Scott. I suppose we have to think about putting a value on it, really. It's difficult to price this sort of material. actually, it's almost priceless in many respects. but a rather touching way with this beautiful drawing done in 1898. And I know Rodrica was thrilled to receive it. We've had such a lovely day here at Burton Constable. The sun has shone upon us. We've been so lucky. From all of us here, until next time, bye-bye. 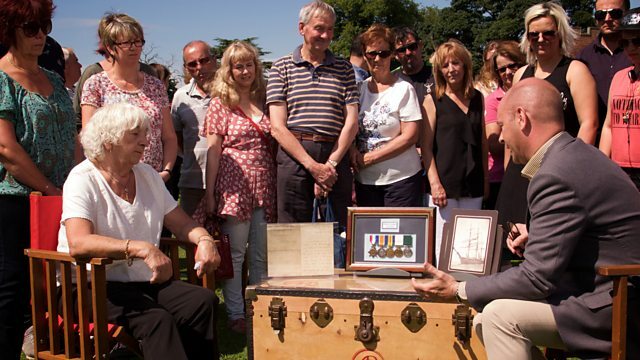 Fiona Bruce and the Antiques Roadshow team head to Burton Constable Hall near Hull, a property filled with family legends and treasures, including a remarkable cabinet of curiosities. Objects brought in by visitors are just as diverse, including a ship's anchor found in a garden pond and a medal given for heroism to a local sailor who helped break Captain Scott's ship out of Antarctic ice in 1901. There is also a rare example of early flat-pack furniture dating back to the 17th century. And for anyone interested in the wisdom of investing in antiques and collectibles, there is a revelation about how a decision to purchase a flimsy booklet proved a much better investment 30 years ago than buying a second-hand car.